I’m glad to be back running closer to sea level after a week at 5,000 feet. My knees and ankles felt a little achey from the rough terrain last week, but it was nice to be able to run without feeling like I had a bag over my head. The temperatures this afternoon were in the mid 70s, just like most of my runs in Honduras, but the humidity was quite a bit higher. I had hoped to get in an easy 10-miles, but it got shortened to six once my stomach started doing cartwheels. I’m sure this is related to my Honduras trip. This happens every time I travel there no matter how careful I attempt to be with food, water, hygiene, etc. I hope that I can get control of it without it affecting my running schedule this week. I’m looking to get in a solid 12-mile run tomorrow and 60+ miles total for this week. Really trying to keep my mileage up as I prepare for leading the 4-hour pace group at the Country Music Marathon in five weeks. That’s going to be a long time on my feet!! This morning the Nashville Striders group training run for the Country Music Marathon was a 20-miler on the Stones River and Shelby Bottoms Greenways. There were several members of our group who were planning to participate (most of them are running Boston), so I decided to join them for at least part of the run. My coach had told me on Thursday that for the next couple of weeks he just wants me to try and keep my mileage up as long as my legs feel good, and then we would start thinking about the specific training plan for Milwaukee. Since I’m only two weeks removed from the NOLA Marathon I decided to just play it by feel with regard to how much distance I would go for today. Most of the route was an out-and-back, so shortening the run would not be a problem. However, I ended up feeling good for the entire run and actually completed 21-miles. I love this route and the run was fantastic. My overall pace was in the 8:30s, but this was a mix of miles from the 9:10s in the beginning to 7:40s at the end. I was especially pleased with how well my legs felt on big hills near the end of the run. Dan and Mary pushed the pace through this section, and my legs felt strong all the way to the end (BTW…Dan and Mary looked great). Right now my confidence is still pretty high from NOLA, and I’m excited about the things my coach has in store for my training over the spring and summer. Beginning tomorrow, my Dad and I leave for an 8-day mission trip to southern Honduras. Not sure how much I’ll get to run, but any mileage completed will be up in the mountains at 5,000 ft above sea level. Two weeks after we get back I’ve got the Oak Barrel Half Marathon in Lynchburg, followed 3-weeks later by the Country Music Marathon (as the 4-hour pacer), and then the 500 Festival Mini Marathon (in Indianapolis) a week after that. Busy Schedule! 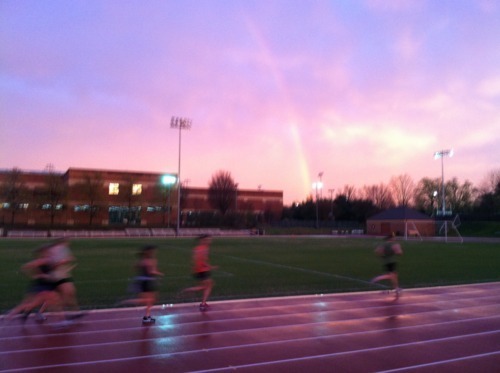 Last night’s track workout was delayed due to a band of storms that moved through the Nashville area between 5:00 and 6:00pm. For a while I thought there was no way we were going to get the workout in, but by 10 minutes after 6pm we were on the track warming up. With warmup and cooldown the workout came out to just under 7-miles for the night. I took it fairly easy since I’m still less than 2-weeks removed from the NOLA Marathon, but generally felt pretty good all evening. I can tell that my legs are still a bit fatigued, but this really only manifests itself when I try to push the pace. I did feel a bit of tightness in my calves tonight after my 6.5-mile Hattori run the morning before. However, I think this is more soreness than strain or injury. Overall, it was a good night at the track! Beast Mode…ON! Easy 6.5-mile run this AM in my Saucony Hattoris with Nathan & Paxton from the EW Nature Center. Slightly faster pace than normal for a Hattori run, especially after the first couple of miles, but it felt pretty effortless. Legs actually felt better than they did yesterday. Really want to do more of my easy miles in these shoes since I can tell such a HUGE difference in my feet and calves since adding them to the rotation. Now will have a full 35 hours off before track tomorrow night. After taking two days off it was good to get back on the road with Nathan this morning for a relatively easy paced 9-mile run. We ran a modified version of our “Steeplechase” route through Percy and Edwin Warner Parks, which is quite hilly. My legs are still a bit sluggish after the marathon last week, but overall this run felt pretty good, especially considering the hills and the humidity. Even at 6am, the temps were in the mid 60s and the humidity was nasty. Not looking forward to the summer months when we get this type of humidity with temps in the 80s and 90s. On a side note, I have decided to hire a coach to help me develop my training plan for the Milwaukee Lakefront Marathon in October. I know I’m going to have to take my training up to another level to qualify for Boston, and I really wanted someone else with a lot of experience to give me their recommendation on what that should look like. Very excited (an nervous) to see what he comes up with. Today has been a pretty miserable day in Nashville with widespread rain, frequent downpours, and gusty wind. I was afraid that our weekly track workout with the JSRC might get cancelled, or that no-one else would show up, so I got to track about an hour early to get in some miles around Vanderbilt campus in case either of these happened. I was pleasantly surprised to see Susan also show up early for the same reasons and we ended up getting in over 5-miles prior to the workout in the heavy rain and wind. By the scheduled start time, Sue Anne, Aine, and Paxton had also arrived and we were able to have a great track workout. Since I am still only four days removed from the NOLA Marathon, I took this workout really easy. Even with the nasty conditions I am happy to have completed the miles. The final total with the warmup, workout, and cool-down was just under 9.5-miles. On a side note, it has been 2-hours since the end of the workout, and I am just now beginning to regain feeling in my toes. I don’t ever remember my feet being as cold as they were after the run was over. During our warmup miles, Susan said “We’re either really tough, or really stupid” to be out here doing this. I responded that to be long distance runners, I think you really have to be a little bit of both. 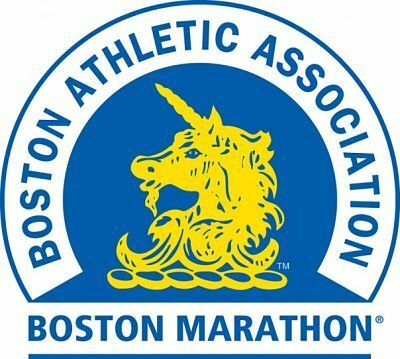 With my 2-year “Quest for 3:15” completed at NOLA on Sunday, today begins a new challenge and a new “Quest.” This time the focus is solely on one thing….BOSTON! Officially that means a 3:10 (or 3:09:59) to qualify, which is 2min 29sec faster than my NOLA finish. However, with the new staggered registration process the actual time to get into Boston could end up being a few minutes faster. Also, it would not be outside the realm of possibility for the B.A.A. to bring the times down even lower. Finally, I’m only three years away from turning 40 which will hopefully bring an expanded qualifying time (currently 3:15). Since the qualifying time could be a moving target, this quest will not be centered on time, but on actually qualifying for and running the Boston Marathon. For the remainder of 2012 I plan to run 3 or 4 additional marathons. One of these will be as the 4-hour pacer for the Country Music Marathon in April, so that will obviously not be an attempt at qualifying. The other race I’m registered for is the Milwaukee Lakefront Marathon in October which will be my next point of focus. After that, I’m in the lottery for NYC again, and thinking about the Chickamauga Battlefield Marathon as a backup option. I know it’s going to take a lot of work, and lots of help from my family and friends, but I’m very much looking forward to the challenge.